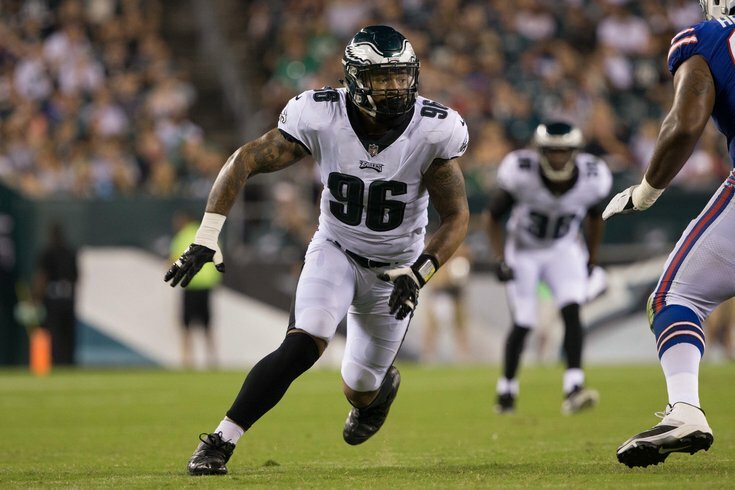 Eagles rookie defensive end Derek Barnett. • Traded back (3 times): Kevin Kolb, Trevor Laws, and Marcus Smith. • Stayed put (10 times): Donovan McNabb, Corey Simon, Freddie Mitchell, Lito Sheppard, Mike Patterson, Brodrick Bunkley, Danny Watkins, Lane Johnson, and Nelson Agholor. In order to move up into that philosophical "20-or-better" range, the only real ammo the Eagles have, without parting with a future No. 1 pick, would be Nick Foles. The Arizona Cardinals would make some level of sense in a trade for Foles, as they sit at pick No. 15. The thinking here is that it would take Foles, plus some extra ammo, to coax that 15th overall pick away. The Buffalo Bills also have a pair of picks just on the outskirts of the top 20, as they sit at picks No. 21 and 22. Beyond a trade of Foles prior to the draft, moving up into Roseman's preferred draft territory feels unlikely. As for staying put or moving back, there's a thinking that there isn't much of a difference between picking at 32nd overall (obviously an amazing problem to have) and a few spots later. Every year, teams trade up into those spots at the end of the first round or the beginning of the second round.